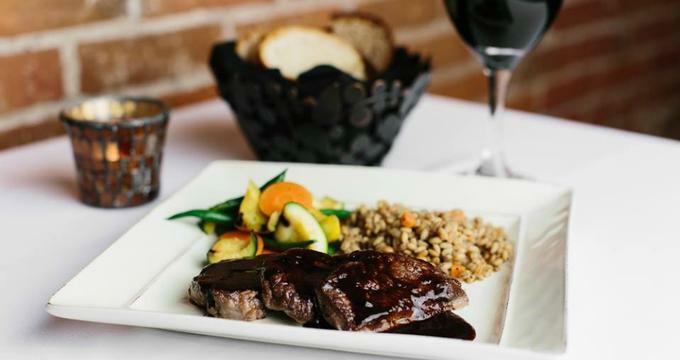 Pirogue Grille combines an elegant, warm atmosphere with a creative seasonal menu to offer customers an enjoyable dining experience in Bismarck, North Dakota. The menu here is diverse but simple, providing diners with just the right amount of menu options to offer variety without creating a menu that feels overwhelming. All the menu items from sauces to desserts are prepared from scratch with locally sourced ingredients. Rounding out the dining experience is the lovely environment, where customers are surrounded by exposed brick walls, beautiful wood and metal accents, and a strategically placed archway that allows guests to get a glimpse of the kitchen as the meals are prepared. Pirogue Grille offers a charmingly elegant dining experience. Reservations for Pirogue Grille can be placed via phone by calling (701) 223-3770. · Appetizers - Eggplant Napoleon, walleye trio of tastes, house-made venison sausage, chicken & peanut pot stickers, and more. · Soups and Salads - Soup of the day; roasted beets salad, hearts of romaine salad, bulgur wheat salad, spinach with house-cured bacon salad, and more. · Entrees - A wide variety of entrees are offered. Some of them include grilled New York steak, house-made fettuccine with chicken, sautéed rainbow trout, grilled filet of beef, sautéed ND bison medallions, breast of free-range chicken, grilled Berkshire pork chop, sautéed sea scallops, grilled wild king salmon, and more. · Desserts - Dessert sampler, Bing cherry ice cream, creme brulee of the day, peaches & cream cheesecake, angel food cake, chocolate tart, Midwest artisanal cheese platter, and more. Pirogue Grille offers specials throughout the week. These specials include an appetizer, an entrée, and a dessert. Updated specials are shared online. Details about specials are also shared via the Pirogue Grille newsletter. Pirogue Grille offers private dining services for a variety of private events. The private dining space is called the Journey Room. This space can accommodate up to 20 guests. Patrons seeking private dining services can build a personalized menu from the options offered at Pirogue Grille. For more detailed information on the Journey Room private dining space at Pirogue Grille, contact the restaurant directly. Parking for Pirogue Grille is available via street parking and the 3rd Street Garage. Parking at the 3rd Street Garage is free after 4:00pm.